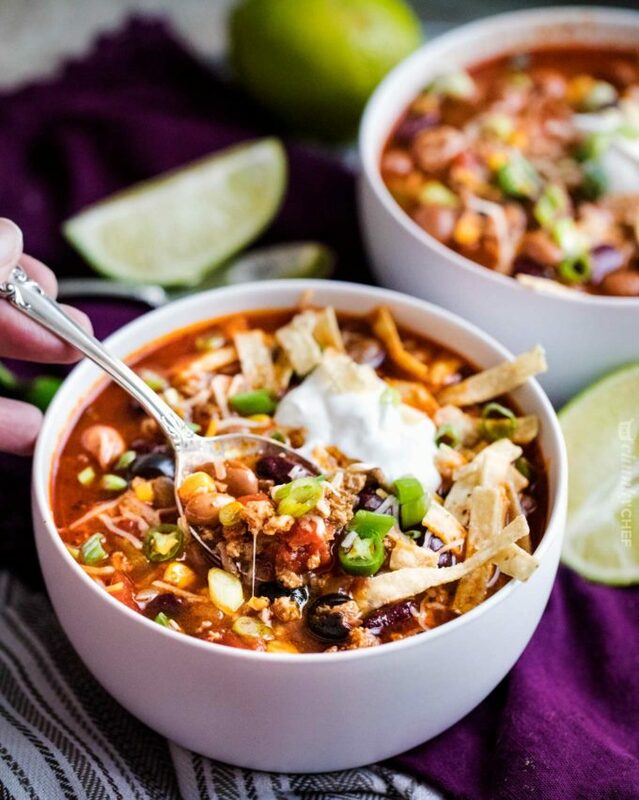 Hearty and filling, this taco soup is made simply in your slow cooker! 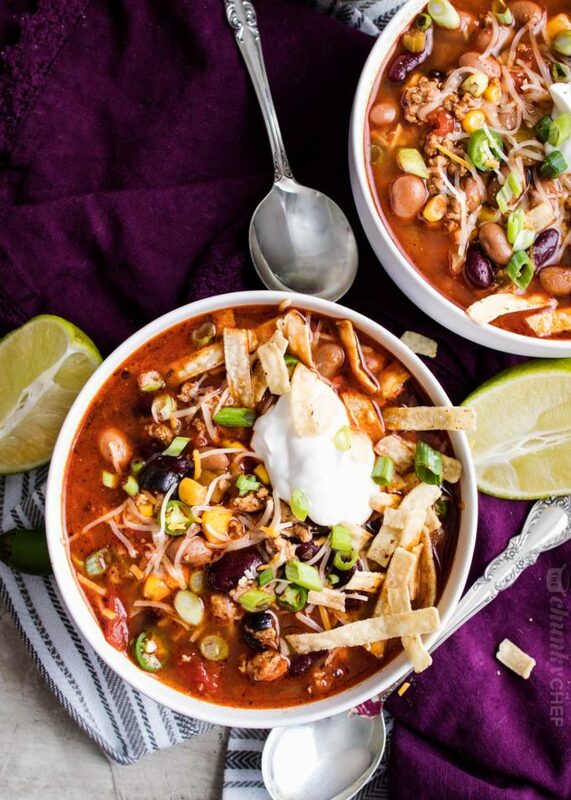 All the great flavors of taco night, in a comforting soup! We are officially into “soup season”, and I am SO excited! I love soup; it’s just so comforting. Especially after a long day when it’s chilly… if only I could get my kids to enjoy soup, I’d be set! 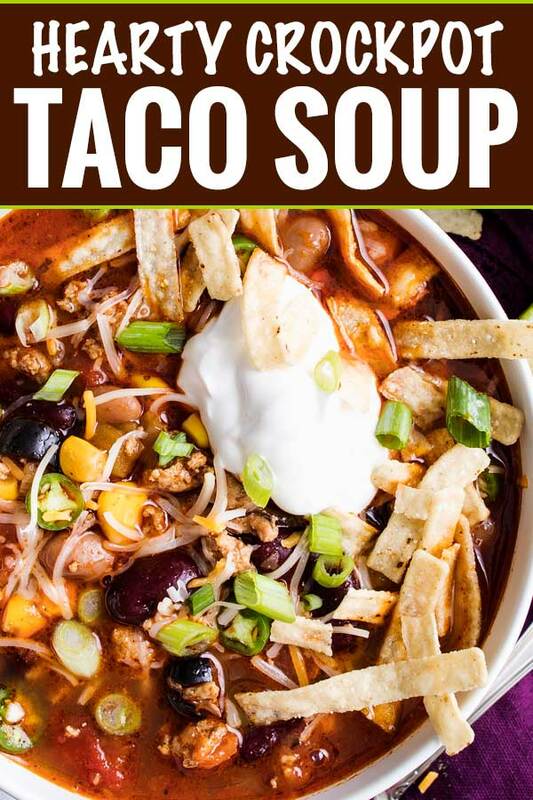 HOW DO YOU MAKE TACO SOUP? Very simply! Start off by browning your meat and then add in all your favorite taco-inspired ingredients. Beans, tomatoes, corn, olives, green chiles, etc. The amount of broth is up to you; it all depends on how thick you want the soup to be. Usually I like my soup on the thinner side, so it’s not so much like chili, so I use the full 4 cups of broth. 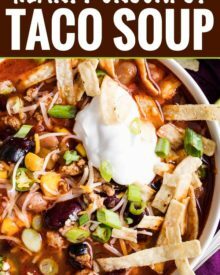 IS TACO SOUP MADE WITH GROUND BEEF? It can be. 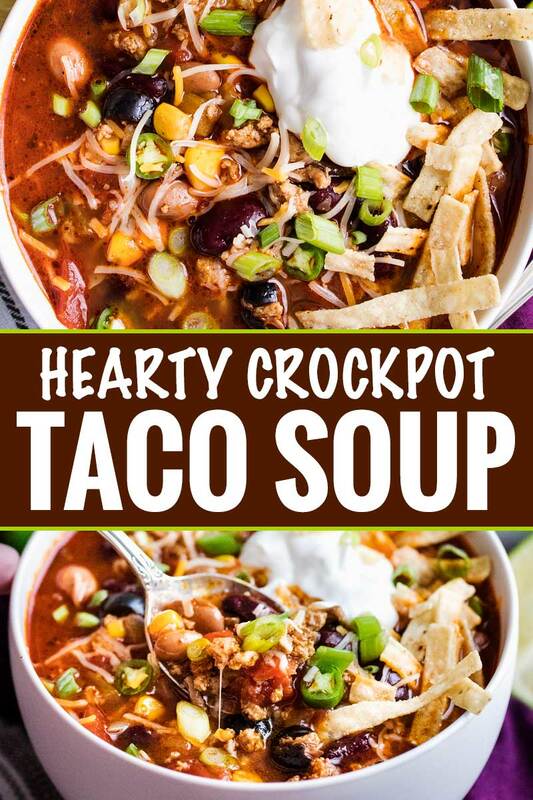 The beauty of a great taco soup is that you can use so many different kinds of meat! This recipe uses half ground beef, half ground turkey… but I’ve made this soup with all beef, all turkey, ground chicken, and shredded chicken. They all taste great! For a fun twist, add in some ground chorizo! CAN YOU MAKE A CREAMY TACO SOUP? Ohhh absolutely!! 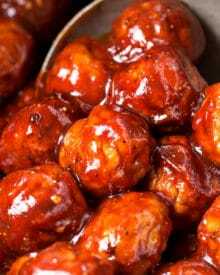 Make the recipe as is, but the last 10-15 minutes of cooking time, add 4 oz cream cheese and 1/2 cup sour cream, and cook on HIGH for 10-15 minutes. You can also add in some shredded cheddar or Mexican blend cheese during this part to make it cheesy! WHAT GOES WELL WITH TACO SOUP? It’s truly a meal all on it’s own, but here are some of my personal favorites to serve alongside! 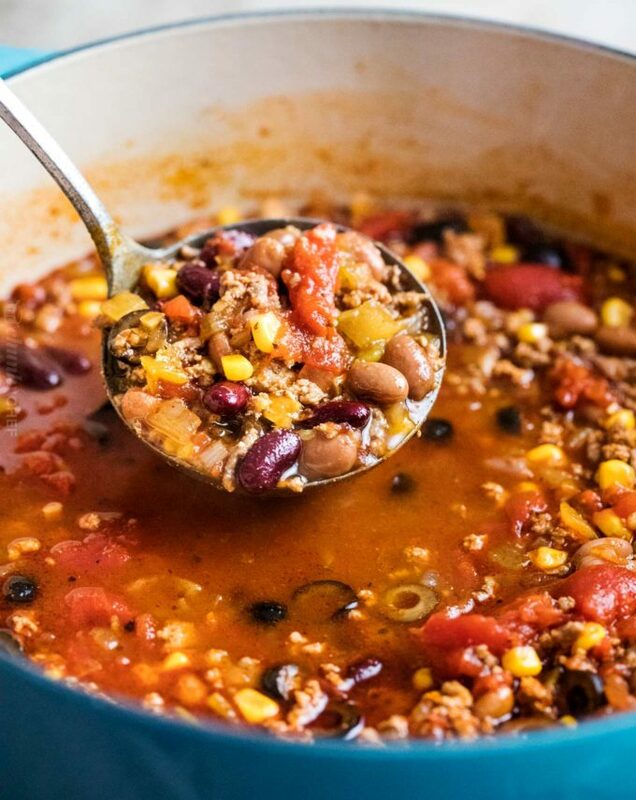 CAN YOU FREEZE TACO SOUP? 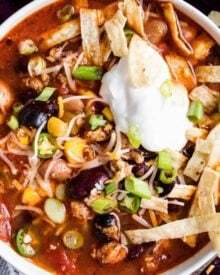 Taco soup is a great soup for freezing! Cook the recipe as directed, then cool completely. Separate into freezer containers that are airtight. Soup can be frozen for 1-3 months. To thaw, place in the refrigerator overnight, then heat on the stovetop or in the microwave until hot. No time to make the homemade taco seasoning? No worries, just use a packet of your favorite taco seasoning. For an extra flavor boost, add a packet of ranch dressing mix. Garnish it up! This soup tastes good on it’s own, but garnishes really take it over the top into “OMG this is delicious” territory! Leftovers of this soup taste amazing, so don’t forget to pack some up for lunch the next day! 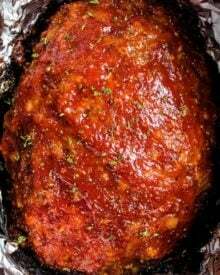 Slow Cooker – my go to crockpot, with even cooking and it’s totally programmable! Dutch Oven – for stovetop cooking, this is my favorite pot to cook soups in! Instant Pot – if you don’t have one, this is a classic one! 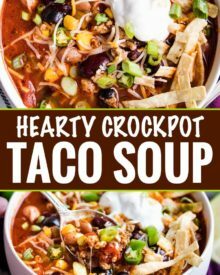 Packed with flavor, this Crockpot Taco Soup tastes just like your favorite taco, in comforting soup form! In a large skillet, add olive oil and onion, and cook 4-5 minutes over MED heat, until soft and slightly charred on the edges. Remove to slow cooker. In the same skillet, add beef and turkey, and cook 5 minutes over MED heat, breaking meat up with a wooden spoon as it cooks. Drain and transfer to slow cooker. Stir in seasoning mixture and all remaining soup ingredients (pinto beans, kidney beans, corn, stewed tomatoes, diced tomatoes, green chiles and olives, and beef base). Pour in beef broth and stir well to combine. Cover and cook on LOW for 4-6 hours, or HIGH for 2-3 hours. Brown onion and meats in a large dutch oven or stockpot, then add seasoning mixture and all remaining soup ingredients to the pot. Bring to a boil, then reduce heat to LOW and simmer about 15-20 minutes. Turn pressure cooker on the Saute setting. Brown onion and meats. Drain if need be. Add seasoning and stir to combine. Add remaining soup ingredients, starting with the broth first. Place the lid on the pot, locking it into place. Turn the steam release to the Sealing position. Cancel the Saute setting and select Pressure Cook (or Manual), and increase the time to 9 minutes. Once cooking time is completed, let the pot sit for 10-15 minutes. Do a controlled quick release by carefully turning the valve towards Venting in little bursts. Make sure you're using a wooden spoon or heat resistant gloves. If no soup is spitting out at you, open the valve all the way to Venting. Once the pin drops, open the lid carefully (steam may come out at you). I love taco soup! I have to try this version! Just to double-check – 4 cans of diced green chiles? That seems like a lot! But it does sounds really good. Hi Gail 🙂 OMG that was a total typo on my part… it’s 1 – 2 cans (4oz each) of the diced green chiles. I usually do one can, but others have enjoyed more of the chiles, so I put a range in there so everyone can make it to their tastes. Thanks for the heads up!! This looks fantastic, craving a big bowl of it! This is seriously making me hungry! It looks really delish! Ultimate comfort food! This looks AMAZING! I am definitely going to try this soon! Oh wow looks so yummy! 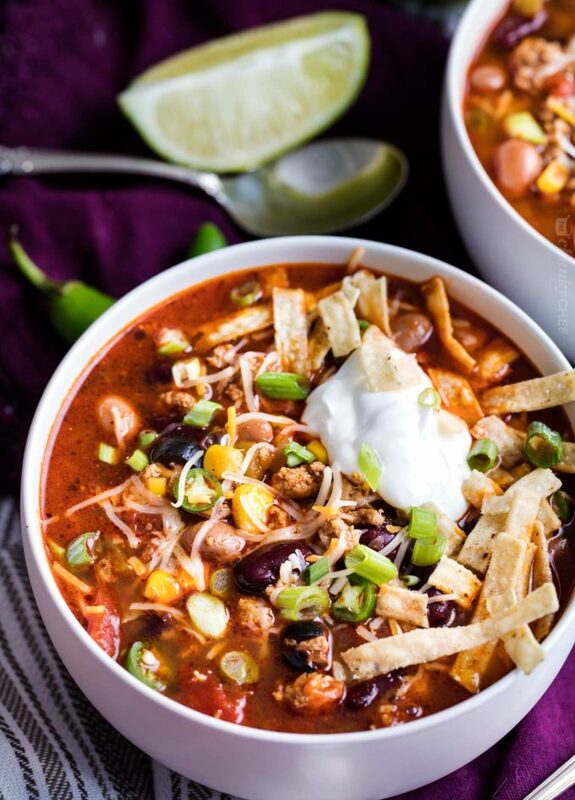 Comfort food at it’s best, so much flavor packed on this taco soup! 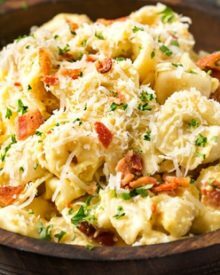 Such a great slow cooker meal especially for the fall! So flavorful!